This limited edition watch is permanently sold out. 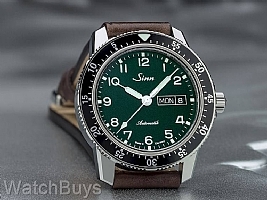 Brand new for BaselWorld 2019, Sinn has designed a limited edition of their classic pilots watch and we are pleased to introduce the new Sinn 104 St Sa A G.
Limited to 500 pieces globally, the Sinn 104 St Sa A G is the first 104 A model to feature a non-black dial. The new model features the same large Arabic numerals that make the original version so iconic, but has opted for a shimmering metallic green instead. An engraved, limited edition marking on the watch rotor adds to the uniqueness of this piece. 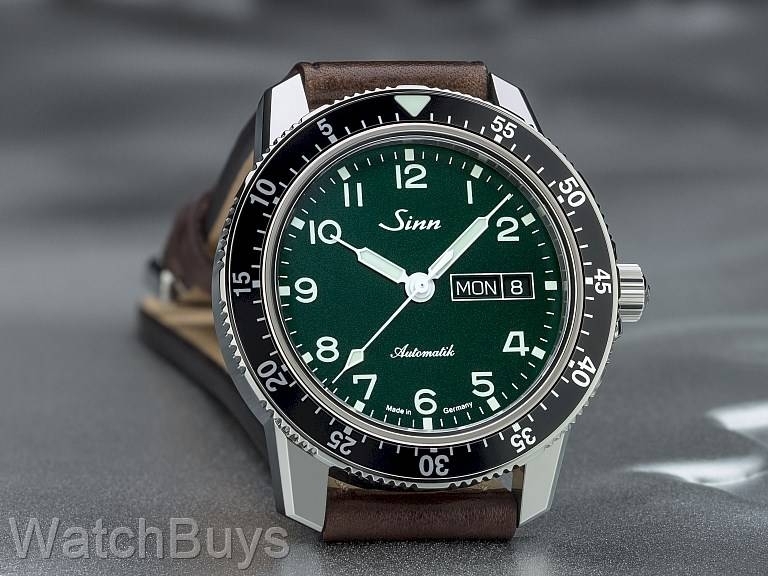 Since its introduction in 2013, the Sinn 104 Series has become an instant classic and one of the most popular models for the brand. Following the success of the original 104 I St Sa model, Sinn introduced the 104 A St Sa two years later, which features large white Arabic numerals set against a black dial. We love the look of this watch and have found that the numerals add increased legibility to this watch and this small dial change makes quite a difference in its overall look. The Sinn 104 St Sa A G dial is highly legible, with its three hands providing optimum readability of the time. As an added benefit, it also features a day/date display at the 3 position with the day display in either English or German (you change the settings through the crown). The pilot's bezel with minute ratcheting can be rotated on both sides, is securely attached to the case, and features luminous triangle as key mark at 12. The 104 St Sa A G is low pressure resistant to secure the sapphire crystal at high altitudes and is water resistant to a depth of 200 meters. This watch is fitted with a vintage style brown calf leather strap.